But first…….. What is the West Coast Trail? 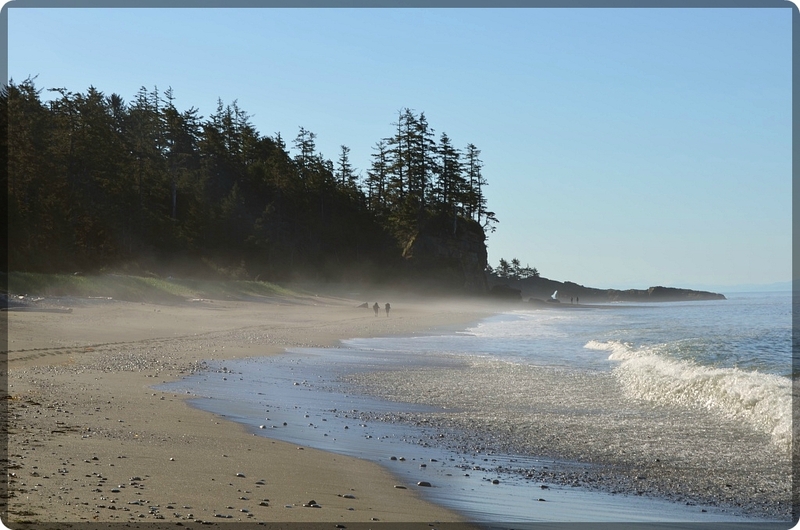 The West Coast Trail (WCT) is a 75 km hike along the west coast of Vancouver Island from Bamfield to Port Renfrew. Various trails have existed here for hundreds of years connecting the Pacheedaht, Ditidaht, and the Huu-ay-aht First Nation communities along the coast. In the early 1900s Europeans brought increased trade and many ships began to travel in these waters hazardous to these foreign sailors. A deadly combination of unpredictable weather and reefs & rocks hiding along the shore have sank some 500 ships and gave the coastal waters the name “Graveyard of the Pacific.” In efforts to save the crewmen, the government built a telegraph line, lighthouses and a system of life-saving stations along the coast – this early trail was the precursor to today’s WCT. As technology advanced helping ships stay afloat, the trail fell into disuse. 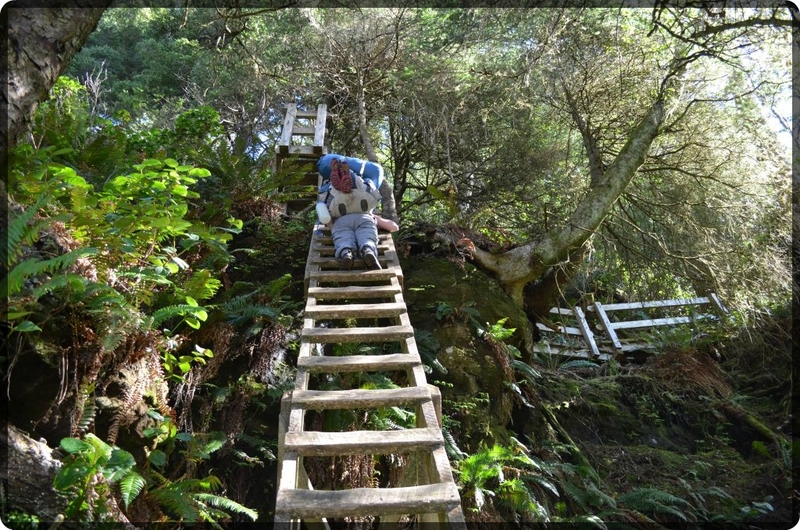 In 1973 the trail became part of the Pacific Rim National Park Reserve and the trails have since been continuously updated for backpackers to use. Things did not get off to a very good start. My sister-in-law had two cars break down on her the day she was supposed to drive over to meet me (bad omen she wondered???) – but we just changed our plans a bit – instead of leaving a car at each trail head, I would just drive up to Nanaimo at an ungodly hour in the morning and pick her up and head to Bamfield – leave my car there and take the bus back to it later…. sounds easy right? (more on how not easy this turned out to be later). We celebrated the small success of being on the road that morning with a 10 pack of Timbits and a large coffee a piece. Our celebration did not last long as we soon discovered neither of us had packed our water filter – they were both sitting in our homes being sad that the other was going on a trip…… but! The key to a successful WCT experience was a positive attitude (or so the guidebook claims), so we moved right along to solving our problem – searching for an outdoor store in Port Alberni. We found only the abandoned building where Alberni Outpost used to stand, so we decided to rely on luck that Bamfield would have something. And success – the general store had iodine tablets! Maybe not the tastiest option, but much, much better than ending up with giardia. We had a mandatory orientation session to attend at 1pm – I found this concept a bit frightening – what could we possibly need to know so badly that we could not go without knowing? Turned out not much – basically just how to read a tide table and identify animal prints (I am not sure why this was essential, but it was interesting – cougars have 4 toes and no claws because they are retractable, whereas the river otter will have 5 toes and wolves will have claws…. something like that). The trail was a breeze – some rotting boardwalk, small bits of mud, mostly flat, so we made great time. We stopped at the sea lion haul out rock just north of Pachena Lighthouse and enjoyed the seemingly not-so-friendly banter of the creatures off shore. To our complete surprise and delight, a whale (perhaps a humpback) emerged beside the rock giving us a perfect view of it as it swam by. We hoped he would return again, but from then on we only saw spouts in the distance – not so exciting once you have seen the real thing. Despite both of us being completely knackered we (‘we’ is questionable) forced ourselves to stay up until high tide…. just to be safe we had pitched our tent far enough back for the water – Sonia was a bit paranoid about this from having a terrible experience previously waking up in the middle of the night to a flooded tent and having to run with all her gear along the beach in search of dry land! Ah beautiful sunshine! Sunscreen – various arrangements of draping clothes over head and backpack, lovely end of the day diving into the pool at the bottom of Tsusiat Falls. Today was also the beginning of the cable cars and ladders that the trail is famed for. That I had both been looking forward to with fea r (cable car) and delight (ladders). There is somewhat of an art to getting into and operating a cable car with two people – an juggling act of who is holding the car, and who is loading the stuff in…. basic rule of thumb – make sure at least one of you is holding it at all times – until you are reading to go! The ride into the middle of the river was exhilarating (and somewhat terrifying for those scared of heights). We looked down from the car and saw a large fish swimming below – oh how I wanted to spear it with my hiking pole and roast it over the fire for dinner tonight! No such luck though as we were miles away from it, and the likelihood of me actually being able to catch it was slim to none… who am I kidding – it was none. Tip for the ladders for those scared of heights: don’t cling to the ladder – it makes it so much harder to move your legs… you end up swinging your huge backpack back and forth increasing the chances of falling! Straighten those arms! Another thing learnt today – string is not nearly as effective as rope to hang a food bag in trees…. better yet use the provided bear boxes! Today was our first ferry crossing – a short jaunt across the Nitinat Narrows. We heard that you can buy fresh crab, halibut, salmon or whatever the catch of the day is here, but we were too early. Instead we just chatted with the locals and I fell in love with Skipper – the 4 month old puppy…. who mischievously tried to get away with my hiking poles! Check back in the next few days for the continuation of our journey along the increasingly rugged West Coast Trail!